Women on a Mission: Mom Edition: BELLA SHIRT! I am about to admit something embarrassing. Except kinda not since not much embarrasses me. I’ve mentioned in the past how much I love Twilight. As in I ignored my family and tapped my toe till the girls’ bedtime when I read the books because I couldn’t get enough. As in I <3 Edward. Big time. Oh Edward, wherefore art thou? I enjoyed the first Twilight movie immensely . Shaun said it didn’t have enough vampire violence and T&A, but he’s watched all the movies numerous times, so I guess he sacrifices for me. The bottom line is that Rob Pattinson is a dreamy Edward and that’s what I was in the market for. 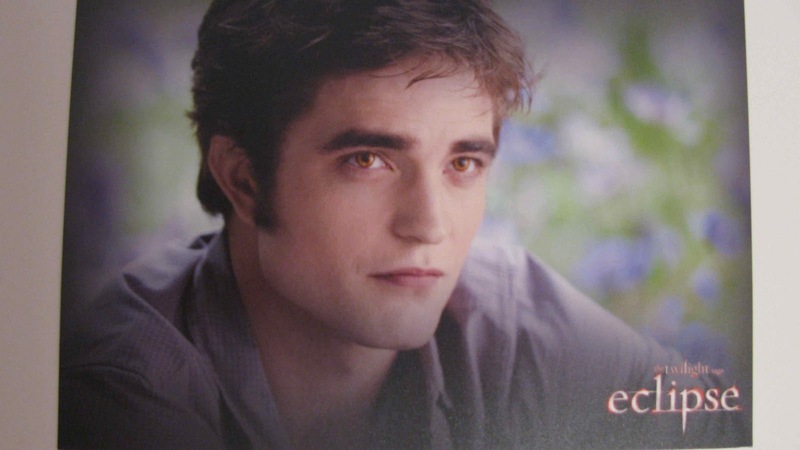 There are a few Edward moments in that first movie that make me swoon. So do you remember in the movie when Edward and Bella see each other for the first time in biology class? Well, in that scene, Bella is wearing an ivory shirt that has her thumbs sticking through the cuffs which I thought was kinda neat. Well, wouldn’t you know it but two Black Fridays ago Thrifty Nana and I ran into this exact same cuff situation at JCPenney’s. For no other reason than the Twilight tie-in, I bought myself one of the shirts. It helped that it was less than $10, being Black Friday and all. help but fall in LOVE with me. I love the cuff deal, but am not a fan of the high crewneck of it. So I’ve barely worn it for the past 2 years. Don’t you think that’s just dumb? Not about buying a shirt just because it reminds me of Twilight. That’s not dumb at all. What’s dumb is not wearing it cuz I don’t like the neckline. I say: 'quit complaining'. Shaun says: ‘sh*t or get off the pot’. Roger that. It was pretty simple. I bought matching burgundy thread at JoAnn’s for $2 (on sale). Then I researched the appropriate stretchy stitch on my sewing machine so the neckline thread wouldn’t snap when I pull the shirt over my head. The machine’s book says: ‘Ric-Rac’ stitch. I tried the shirt on to mark how low the v-neckline to go and marked it with a safety pin. I cut down the center of the front neckline to the safety pin. I sewed the ric-rac stitch along the raw edges. I think it’s much cuter. Maybe a little too tight of a shirt to wear my Bombshell bra, but at least cleavage is visible now! LOVE IT. I def shouldn’t have waited two years to fix my Bella shirt. What easy fixes have you done on your clothes lately? More importantly, will I be seeing you at the theater on November 18th?